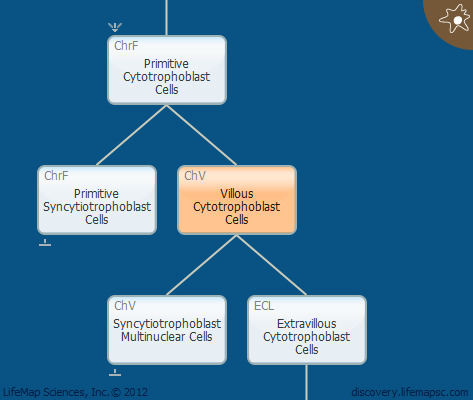 The villous cytotrophoblast cellss are located in the innermost chorionic villi layer of the placenta. These are mononuclear cells which are found as early as day 7 in humans and are characteristic of stages 8.00-13.00 of mouse development. The cells of this layer either fuse to form the overlying multinucleated syncytiotrophoblast or, assume invasive capabilities in anchoring villi that attach the placenta to the uterus, and break through the syncytiotrophoblast to form the extravillous cytotrophoblast cells and later the column cytotrophoblast cells that physically connect the placenta to the decidua. A temporally regulated system has been suggested for the variant differentiation process, which is proposed to involve genetic regulation of early first trimester villous cytotrophoblast, pointing them in the direction of invasion in the absence of the maternal environment. Later, term villous cytotrophoblasts are suggested to be under a different genetic program that impels them to syncytialize rather than invade, although they retain some invasive capacities.